SPARK KOMUCHA from Squamish, BC is back at the Ruddy! I love the re-fill station. 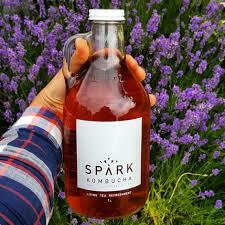 Buy a 1 or 2 litre super cute growler, and then just re-fill in the store as needed. Way less waste than single use bottles. You can also buy a 12 oz (compostable) cup in the store, if you need a Komucha fix right away.